Just four of us met at Waterloo for the 17:27 to Brussels Midi, Bernard Salmon and his wife having travelled to Berlin the previous day. The journey to Brussels on Eurostar was uneventful and on time, giving us time for refreshment at Brussels before catching the 23:40 to Berlin Zoo. Arrival at Berlin Zoo was on time at 08:50 on a warm and sunny morning, where we were met by Hartmut Schnorr and Berlin S-Bahn driver Jochen Habranech, who then conducted us to our hotel. Once at the hotel, we met Bernard Salmon and his wife who had checked in on Saturday. As our rooms were not ready at this early hour, we took breakfast, during which Hartmut gave us an outline of the arrangements made for the week. He also presented us with a folder detailing the various visits and travel arrangements. Additionally, we were each given a Gstekarte ticket that provided free travel on Berlin and Potsdam buses; trains and ships; the Berlin S-Bahn; U-Bahn and Berlin Regional services of DB. This proved a very useful means of getting around Berlin and district during the week. By the time we had finished breakfast our rooms were ready for occupation. After a short rest, wash and brush up, we departed for the Berlin S-Bahn main works at Schneweide. On arrival at Schneweide station, we were met by Locomotive & Carriage Institution members and employees of the S-Bahn, Hartmut Schnorr and Ralph Braune, before riding into the works on an empty stock working. Upon arrival in the works we were met by Herr Bottcher, who gave us an introduction to the works and S-Bahn stock maintenance policy, before conducting us on the tour. Prior to walking into the first shop we passed withdrawn S-Bahn Class 475 unit number 475-114, being stripped before its final journey to the scrap yard. As well as removing useful components, the current collector shoes and body-side valances were being cut off to allow transport within gauge over DB lines. Alongside the 475 was a 2-car yellow unit, named “Universal-Reinigungsmashine Fr Gleusoberflchen” or, in other words, “The Hoover Train”. This was not a BR Class 50 alas, but two converted driving motor coaches from a S-Bahn class 476 unit. This is used to clean track of rubbish in station platform areas at night, after close of service. However, the noise produced by this unit has caused some complaints from local residents. Even though smoking is barred throughout the S-Bahn, it was noticeable how many cigarette butts were collected in the waste from this machine. We then walked into the works building, following the various stages of repairs carried out on the S-Bahn units. Walking into the stripping shop, we saw windows; seats and interior woodwork being removed from the cars before transfer to the next stage of the repair cycle. Because of the high levels of vandalism, which includes window scratching, some units are simply re-glazed and re-seated before return to service the same day. Two 2-car units can receive this treatment per day. Seat and window replacement alone costs the Berlin 5-Bahn some DM7 million per annum (about £2.5 million). The vandals themselves, when caught undertake some of this work. The S-Bahn have experimented with adhesive plastic film on the inside of the car windows, but these have had to be removed due to concerns on fire safety, though a car fitted with window film was noted in service during our stay in Berlin. A fire-proof film is currently awaited. After the stripping shop, the cars are moved to the main workshop area, where the bodies are lifted off the bogies; the two parts then taking different routes through the works. The traction motors are removed from the bogies and are stripped for cleaning and repair. Wheelsets are taken to a separate shop where the wheel treads are turned or, if they have reached the end of their useful life, pressed off the axle and a new wheel pressed on. Older bogies can suffer from cracking and therefore require more attention. Traction motors are taken to a separate shop where they are stripped and cleaned before re-assembly and mechanical and electrical tests. DC motors are repaired in-house at a cost of DM15,000 (£5,000) each, but modern AC motors are returned to Siemens, who undertake refurbishment for DM60,000 (£20,000). Coach bodies are taken into the body shop where all body and electrical repairs are carried out, including collision damage. All classes of unit have steel bodies except the aluminium-bodied class 485, which were introduced by the DR from 1988. Units from Classes 475; 476; 477; 480 and 485 were noted in the works. The 475s would be making their final visit before being replaced by the new Class 481s. After the cars are reunited with their bogies and reassembled, they are moved into the paint spray booth, which handles one car at a time. Paint now used has a service life of six to eight years and has improved resistance to abrasion caused by mechanical washing plants and chemicals used for graffiti removal. Located adjacent to the paint shop is the trimming shop where seats from the pre-war stock (classes 475; 476 and 477) are trimmed. The material now used for the retrimming is a multi-coloured ‘graffiti’ patterned Rexene, which is being used to discourage graffiti. Unfortunately, up to 1,000 seats per month are now being slashed with knives... A knife resistant material incorporating a metal mesh has been developed, but at DM100 (35) per square metre, is five times more expensive than the current Rexene and is not affordable. Newer stock has pre-formed, factory made seat cushions, also in graffiti pattern. Strangely, the class 481s - currently being delivered, have single-colour seat cushions which, on one unit noted in service, can get heavily covered in graffiti! Women mainly staff the trimming shop and it was noticeable how many pot plants were growing in this area of the works. After the units are reformed, they must undergo a 60KM fault-free test run before they will be accepted by the operating department. Six classes of units are currently maintained in the works with new units covering up to 330,000 Km before shopping. The works celebrated its 70th birthday in 1997 and has recently gained ISO 9001 Quality Assurance. Before the reunification, over 2,000 staff were employed in the works. This has now dropped to 900 and will be reduced to 600 by the year 2003 as a result of replacement of all pre-war stock, which requires more maintenance. No redundancies have taken place; all staff either retiring or relocated elsewhere on the expanding S-Bahn network. There are 130 women employed on various duties throughout the works. Comprehensive sports facilities are provided in the works grounds. After completing the tour around the works, Herr Bttcher took us to his office for refreshments and to look at some photographs. There was also the opportunity to discuss the S-Bahn in general. Funding for the S-Bahn is received from the state and the Berlin Transport Authority (BVG). The money is allocated on a contract basis and Is reduced for poor performance - the first reduction taking place when service reliability falls below 94% on-time. Rolling stock failures make this target hard to achieve. The S-Bahn is expanding all the time and now carries one million passengers daily compared with 800,000 in 1994. After thanking Herr Bttcher for an interesting afternoon, we made our way out of the works with Herr Schnorr to Grunewald. We sat down for tea and a chat in a café on the edge of Grunewald, which is a popular area for horse riding. During the chat and with the aid of an electronic language translator, Herr Schnorr informed us that he kept a “grizzly parrot” at home. This turned out to be a grey parrot, the error being due to trouble with the translator! Returning to Grouewald S-Bahn station, we caught a lift on an empty stock working to the nearby S-Bahn stabling sidings. Adjacent to the siding was a modern signalling centre and S-Bahn offices “Kpenick depot of Historische S-Bahn e V”, the historic SBahn train depot. The depot building is a former S-Bahn steam shed, opened in 1907 and was converted for electric traction in 1927, when the Wansee section of the S-Bahn was electrified (article on the Berlin S-Bahn to appear on this web site shortly). The depot consists of five roads and houses 24 historic S-Bahn units going back to a 1922 “Bernau” unit, which was introduced with the first major electrification scheme. The depot was given to the preservation group of Historische S-Bahn e V by the Berlin S-Bahn company and each of the 24 units was sold to the group for DM1.5 (0.50p) each! The three surviving trailers of the original Bernau units. These trailers were four-wheeled, had single leaf doors and small windows and were very close-coupled. The trailers were used by the works department, but unfortunately no driving power cars have survived. An example of a high speed “Bankers Train”. Used to transport bankers and business people from Berlin to the Wansee and Potsdam. These units were capable of 140 kph, compared to 80 kph of standard S-Bahn units. These were the first S-Bahn units to be of welded construction and were introduced from 1934. After World War II, they were converted to run as conventional S-Bahn units with a top speed of 80 kph. Nearly all classes and sub-classes of pre-war S-Bahn units are included in the collection. Renovation to full working order is undertaken by a group of volunteers working most days of the week but, like all such organisations, is limited by cash. Some historic signalling equipment is also stored in the depot awaiting eventual restoration. It is noteworthy that the depot was fully signalled and electrified to enable running onto the S-Bahn system; excursions with historic units being occasionally run. Following a refreshment break and chat, we returned to Berlin, Herr Schnorr having a train stopped at the nearby S-Bahn staff platform. An early start was made in order to arrive at the ADtranz plant in Hennigsdorf for 09:30. On the bus from the S-Bahn station at Tegal to Hennigsdorf, restoration work on the Hennigsdorf line was noted. Outside the plant main gate we met four of the Locomotive & Carriage Institute German members who would accompany us on the tour. We were then introduced to Herr Kohl, Project Manager and Frau Hasenegger, Press Officer who were to be our guides for the morning’s tour. The plant was founded in 1911 by AEG as their first locomotive factory. It was destroyed by the allies in World War II and subsequently rebuilt. After the war the plant was taken over by the German Democratic Republic and employed up to 8 000 workers. After reunification, the plant was returned to private ownership and now employs 3 000. The factory was renovated in 1996 for DM600m (250m). In the assembly hall was the unusual sight of trains, trains and metro cars all sharing the same shop floor. The trams were a second series of three-section, articulated, low-floor cars being built for use in Berlin. A bogie is fitted under each section and is totally enclosed. All electrical equipment is built into the roof area and a wheelchair/pram lift is provided at one end. Doors for lift and pram access are marked and a disabled assistance call button is provided. The units are fitted out to a high standard with black/grey cloth seats and plenty of well-located yellow grab handles. Externally the units are painted yellow with white roofs and black bonded glazing, the colours of the Berlin UVG authority. Alongside the trains were coaches for DB class VT611; tilting 2-car diesel multiple units. Each car is equipped with a 12-cylinder MTU 540kw (720hp) diesel engine driving a hydraulic Voith transmission. There are three braking systems provided; air operated discs; magnetic track and hydrodynamic systems. Tilt is an electrically driven ADtranz/ESW Neicontrol-E system providing up to 8o of tilt. Trackside transducers transmit information to the train of oncoming curves. Air conditioning and power operated plug doors are provided as well as interior and exterior dot-matrix displays. Inside, 1st and 2nd class accommodation is provided as well as a large parcel and cycle area, which is also fitted with ten tip up seats. Units are either finished in red and white or green and white schemes. In complete contrast, opposite the VT611s were the final vehicles for the Guanghou Metro in Canton, China. Each 2-car unit consisted of a driving motorcar and a trailer. These units had a basic interior, designed for mass people moving, not comfort. The seats were transverse bare stainless steel and narrow, to provide maximum standing area. Sliding doors slid into traditional style body pockets reducing window area. Air conditioning is provided and noteworthy were the exceptionally large gangways within the units. Bogies were provided by Siemens. Moving outside the assembly hall we passed several of the Guanghou units on the test track, some of which were receiving final attention. From here we moved into the test shed which housed high voltage electrical test equipment. Inside were ICE-2 sets 402-012 and 402-027. They had been running as 14-car units with a power car each end and are now being reformed as 8-car units by the addition of new driving trailers. 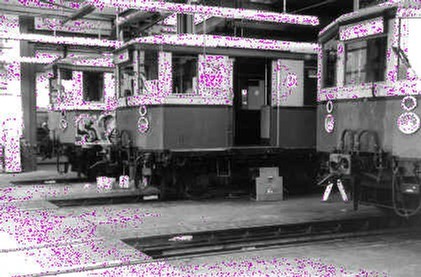 The two units in the shed were receiving electrical testing after reformation. Also in the shed were two Berlin S-Bahn 2-car Class 481s receiving electrical testing before delivery. Finally we moved to another building that was being used for final commissioning and testing of three brand new class 145 Bo-Bo electric locomotives for DB Cargo. The first four locomotives of this class were built in Hennigsdorf in July/August 1997 for delivery in early 1998, the remaining 76 for this order of 80 locomotives will be built in Kassel. The first locomotive, 145-001, was available for our inspection. Amongst the items noted in the cab was a diagnostic panel for locating, recording and rectifying faults and a socket is available for downloading to a laptop computer. Driving controls consist of a power lever, speed selection lever and three brake control levers. Air conditioning and a small fridge are fitted in each cab. The cab and equipment rooms are spacious and well laid out. It was noted that the brake frame was particularly neat. These locomotives produce 4.8mw (6,400hp) of power and have a maximum speed of 140kph (87.5mph). Our tour was concluded by refreshments al-fresco, kindly provided by our hosts. After the tour our German members and friends returned to their various places of work, leaving those more fortunate members with a free afternoon that we intended to spend on a steamboat ride, unfortunately in vain. We travelled on a DB Berlin Regional train to Potsdam, from where the steamboat operated. It was discovered that the next sailing was scheduled for 16:00, which gave us a long, leisurely lunch break. On returning to the berth, we were informed by a crew member that the 16:00 sailing was cancelled. Fortunately, the afternoon was recovered by taking a pleasant cruise on a waterbus to Wansee. Wednesday morning saw a more civilised start at 09:00 from the hotel, travelling first to Charlottenburg S-Bahn station to meet Herr Schnorr and Herr Groe before back tracking past our start point at Konstanzer Straße. We went on to the control room for line U7, located at the headquarters building of BVG (Berlin Transport Authority) at Kleistpark. The journey to Kleistpark was made on prototype H class unit 5001; this being one of just two experimental 6-car units. The most interesting feature of this eye-catching unit was that the interior was like a long tube. There are no end walls at the ends of the coaches, just a full coach width gangway between vehicles (very similar to a tram or bendy-bus). Each station, with information on connecting services was automatically announced and displayed at each stop. These ADtranz built units are presently manually driven, but will be controlled automatically in the future. The Kleistpark control room, as well as housing the signalling control workstations for line U7, also contains the Betriebsleitstelle U-Bahn, or BLU, which is the central monitoring centre for all U-Bahn lines. Line U7 is the longest at 32km (20miles) and has 40 stations. During the rush hours, some 40 trains are in service. Not all services run the full length of the route, with trains reversing at various crossovers. The signalling system is similar to that employed by London Underground in that the signals are ‘distant’ and ‘stop’; however, distant signals are only provided where there is less than 200m sighting distance to the stop signal. Twelve work stations are located in the control room, three of which are used by U7 controllers. A fourth desk, in the centre, is occupied by the “Leader of line U 7”, who makes strategic decisions and issues instructions to the line controllers, especially at times of disruption. The remaining desks are either unoccupied or used by the U-Bahn Central Monitoring Team. Each line controller works a seven-hour shift and is allowed a ten-minute break every hour. Twelve weeks training is given and the control room is manned continuously. Each controller is issued with a personal ID card, which is used to activate the workstation at the start of each shift. All actions taken by the controllers are recorded so that, if there is a problem, a printout can be obtained. An Arcatel “Command 900” control system is used on line U7, with the controllers’ interface hardware and software being produced by Seimens. Each workstation is equipped with three monitors. Two show, at the top of the screen, a track diagram of the section controlled by that workstation, whilst the bottom half shows an overview of the entire line, including crossovers and stations. The third shows the interlocking. On each track diagram, routes not set are shown in grey, routes set are indicated in yellow and occupied sections are displayed in red. Above each occupied section, the train ID is shown in one of three colours, depending on the train’s timekeeping. Green - on time or up to 90 seconds late; yellow - 90 seconds to 3 minutes late; red - more than 3 minutes late. The control room contacts drivers when operating over three minutes late and the reason for the delay recorded. Individual signal aspects are also shown. Signalling and all train movements, including reversals, are controlled automatically whilst the service runs at or close to time. Operator intervention is required for out-of course running and untimetabled services. A single channel radio system is installed on line U7, which can be utilised by the controllers to advise drivers to speed up or slow down train speed to regain timetable position or other changes in booked operation. A digital train radio is planned, but currently cannot be financed. Signal post telephones are also installed, calls being indicated on a separate key and lamp unit by signal ID. Train ID is by a five-digit code, which indicates departure time, origin and destination station. Train ID’s are allocated and automatically transmitted to the train at points of origin. A transmitter on each train broadcasts the leading car number to transponders between the rails at each track section, which is then checked by the computer against the train ID. Certain ID’s are reserved and manually interposed by the operators for special workings. An operator can point and click the computer’s mouse on a train ID and obtain details of the car numbers of that unit and service history, which includes KM run. Nine remote interlockings are operated from the control room. Each is driven by three computers. Interlocking decisions are made by two active computers; the other computer, on standby, is consulted in the event of a disagreement between the other two. The controller’s third monitor can be used to obtain more detail about route interlocking during times of problems. Additionally, each remote interlocking can be locally controlled from a panel in an emergency. Depot internal movements are locally controlled and electronic axle counters are used instead of track circuits. At each station, ‘Solari’ flap platform indicators are locally controlled. An automatic centrally controlled system is due for installation in 1999. Newly introduced ‘flying staff’ travel from station to station at times of disruption to give assistance to passengers as well as providing first-level security. Additional station security is contracted out. Total train KM are recorded, both for maintenance and payment of subsidy from the city authority. If insufficient train KM are run, the subsidy is reduced. At the end of the visit, a Locomotive & Carriage Institution certificate was presented in appreciation of the time and assistance offered to the Institution by the BVG management and staff. The visit concluded just after midday, giving the afternoon free to indulge in sightseeing. A very early start was made in order to catch the 07:13 from Berlin Lichtenberg to Spremberg in the Lusatia area of Saxony to visit LAUBAG - The Lignite Mining Company. On arrival at Spremberg, we were met by Rainer Schullenberg and other German members of the Institution who, between them, provided transport to the mine. At the LAUBAG reception area we were introduced to our guides, Uwe Schellenberger and Evelyn Burkhardt of the LAUBAG’s public relations department. Over coffee we were given an introduction to the company and forthcoming tour. LAUBAG was formed in 1990 from the DDR (East German) State Mining Company. The privatisation of the former state owned mines was made to make the mining of lignite profitable. It is now mined in four areas of Germany. LAUBAG currently mine in three areas in Lusatia, which are: JnschwaldelCottbus, Welzow-Sd and Nochtenl/Reichwalde. The three fields are connected by the LAUBAG’s own 1,435mm (4’ 8”) railway system to power stations within the region and the DB National Network. Some of the older power stations are still owned by the LAUBAG, but these will close in due course and the company will then concentrate on mining and the associated railway operation. The new power stations currently coming on stream will meet EU standards for pollution control. The lignite reserves in Lusatia amount to 13 billion tonnes (12.8 billion tons), but only 2.4 billion tonnes have been approved for mining by the Saxony Government. Seventeen mines were in operation until 1989, but only five are now operational due to the drop in demand. It is envisaged that the remaining mines will be operated for the next forty years. Fifty million tonnes are mined annually, the majority of which is consumed by local power stations, due to the high moisture content of the coal. If it is transported over long distances, the moisture content is reduced, degrading quality. The LAUBAG railway system covers 384km (240miIes) of track, 769 points, 56 level crossings and 137 bridges. It is electrified throughout at 2,400V DC. The railway is divided into three regions, Cottbus, Welzow and Boxberg; each with its own manager. The motive power and rolling stock comprise 81 electric locomotives, a small number of diesel locomotives, 592 wagons (84-85M2) and 453 auxiliary wagons. Coal trains consist of 16 wagons and carry 960 tonnes. As well as the transportation of coal, ash and gypsum is transported from the power plants in special wagons. Clay is also transported to a local plant for brick and bottle making. As well as internal wagons, DBAG wagons are used to convey limestone to the power plants as well as gypsum and coal for onward passage over the DBAG network. All loaded coal and clay wagons are weighed on scales whilst on the move, at 5 to 12KPH. Scales are also used in winter to detect frozen coal. Due to the high moisture content, the coal can easily freeze, making it difficult to unload. It is defrosted by either special hot air jets, which blow the coal from the wagons, or by passing the train through a hot air tunnel. A complete train of 16 wagons is defrosted over two to three hours at temperatures of 70 to 80C (158 to 176F). Despite all this, problems still occur discharging frozen coal. As well as using coal from the LAUBAG mines, coal is also brought in from mines in the Berlin Region and Southern Germany. Power plants do not hold stockpiles, with coal being delivered by the trains ‘just in time’ according to a monthly programme, which is adjusted on a weekly or daily basis as required. Ash and gypsum are stored in silos by the power plants and removed regularly. If the silos are not emptied, the power plant must be shut down. Problems occurred last winter as high coal demand produced too much ash. Whilst coal consumption should provide a guide on the amount of ash produced, sometimes this does not meet predictions, causing difficulties. Our visit started with the “Zentrule Betriebrleitung des ZEB” or Central Railway Operating Building, located at Schwarze Pumpe. On the top floor of this two story purpose-built circular building is the central IECC. Eventually, the IECC will control the whole network and the first two completed phases of the resignalling have already taken place, taking over from three manual signal boxes. The scheme is due for completion in 2000, when all manual boxes will be abolished. The signalling technology is from Seimens. Traditionally LAUBAG has been more up to date than the German National Railways. The back of the control room is dominated by a colour LCD video wall, showing a live diagrammatic display of the whole network, similar to that seen in Gotenburgh the previous year. Each area of the network is controlled by a workstation, which is manned by two controllers. All controllers previously worked in the old manual signal boxes. Each workstation is equipped with three monitors showing a close-up of the area being controlled. Trains are shown on the monitors and video wall in different colours, depending on whether they are coal or ash, loaded or unloaded. Trains are remotely controlled when discharging. A colour touchscreen telephone is also installed at each workstation. All calls are recorded on equipment identical to that used by Railtrack in many locations in the U.K.
An operating supervisor in the control room is able to interrogate the IECC computer and see the position of any train on the network. He is also able to see displays of the capacity of the coal bunkers at all of the power plants. His task is to organise train delivery to meet the demand of each power plant. On-time delivery is of primary importance. Downstairs, we visited the IECC simulator, which is used to train operators. Different train running scenarios can be run on the simulator, including accidents and crashes. Twenty days are required to train an operator from a manual signalbox to use the IECC. The training is similar to that undertaken by DBAG. All locomotive and wagon maintenance is carried out in the Central Workshop. The building was erected in 1959 by the GDR as a gasification and power plant and was converted to its present role after reunification. Work carried out includes both repairs to railway equipment and to some general mining machinery, such as bulldozers, conveyor belts, gears and transformers. Wagon washing is also carried out in an adjacent building. Over one hundred staff are employed in the workshops. An internal standard gauge railway is used for movement of materials around the works. Electric and diesel locomotives are maintained in separate shops. The diesel locomotives are of similar design to shunting locomotives used by DBAG. The electric locomotives are all of the same class and were built in 1960 in Hennigsdorf, but have been substantially modified by LAUBAG over the years with improvements to lubrication, safety systems and compressors. The locomotives are Co-Co with a central cab and rated at 1,320kw (1,760hp). They are fitted with six pantographs; two vertical for overhead current collection and four at 450, arranged two each side -one above the other - for working in loading and unloading areas. One each side collects traction current, the other is for slow speed remote control operation. A special shed is used for high-pressure hot water and chemical washing of wagons. Rotary wagons are washed with hot water and brushes whilst other wagons are washed with high pressure hot water. Hot water jets at a variety of angles are automatically passed along a single stationary wagon. Different chemicals, temperatures and pressures can be used, depending on contaminant, up to 600C (1,400F) and 100 bar (1,410psi). A demonstration of the plant was quite impressive! After a fine lunch, we were taken by car to Weltow-sd, one of LAUBAG’s opencast mines. The mines are cut in steps down to the coal, the overburden being transferred from one side of the mine to the other via a moving conveyor bridge, which is of contractible construction and can be expanded up to 623m (680 yard). The overburden, which is principally sand, is removed at up to 500 000 m3 (654 000 yard3) per day. Coal is mined at a rate of 50,000 tonnes (49,000 tons) per day and requires 50 trains per day to remove. Coal is transported after mining by conveyor to a short-term stockpile bunker, which is divided into twelve sections for grading the coal. After mixing, the coal is reloaded back onto the conveyor for transport to the trains. It is possible to load three trains per hour. The majority of the coal is used by the power stations, but some is retained by LAUBAG for briquette production. As the mine progresses, some villages are relocated. The present mine has coal reserves for 100 years, but will be closed in 2032, due to state-imposed land control. Once coal production ceases, the land is generally returned to its original condition. The last stage of our tour was to a restored area, which had originally been of a flat and sandy nature. The local people requested a hill to add interest to the landscape and this was produced by filling in an area of 400ha (988 acres) 30m (33yards) lower than original height. Ground water has to be controlled in these restored areas as during mining water was pumped away, so the restored area is dry. This does not affect growth, but if the water is allowed to rise, subsidence could result. The water is sold for industrial and drinking use. After thanking our guides for a very interesting visit, we returned to Berlin. Friday was a free day and the opportunity was taken to see the sights of Berlin, which is presently seeing much reconstruction in the former Eastern Sector. Some members took the opportunity to ride on a steamboat on the River Spree. In the evening, at the invitation of Hartmut Schnorr, we attended a very pleasant social evening in the pub Alt Nurnburg, located in the Europa Centre close to Berlin Zoologischer Garten. On Saturday we transferred to Dresden, where we met our members Katrin and Rainer, and took a journey on the DBAG meter-gauge steam railway from Radebuel Ost to Radeburg, which is at present threatened with closure. Our hotel was located opposite the DBAG locomotive depot and workshops in Dresden. From our bedrooms we could observe some old stock, which included a cannibalised Class 41 2-8-2 locomotive, which some members gave detailed inspection to after a very pleasant and bibulous evening in a local restaurant. On Sunday morning, some of the group travelled to Prague far a further week’s holiday.